ACRYLIC ON BOARD, 12" BY 6"
When my brother Ward and I visited Cape Cod in August 2000, we stayed at the house of the Reverend Doctor Gene Goetchius and his wife Ann. Their son Kirk, who is an artist, had a show of his new work open at a small gallery on the Cape while we were there... naturally, we visited the show. This work immediately caught my eye. 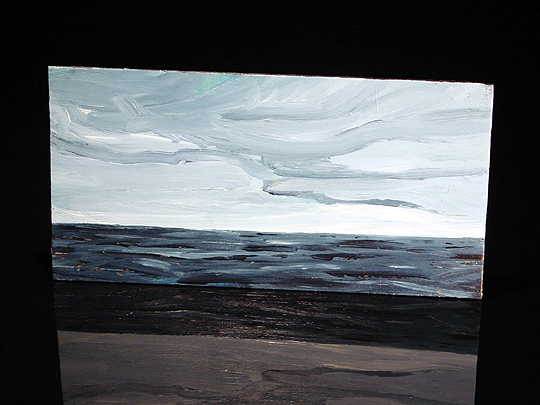 Basically, this is a small seascape in blue and grey... from the title, you can see that it's a November sky. I like this work for both its representational and abstract qualities.